The Texas Child Labor Law Poster is a child labor law poster by the Texas Workforce Commission. This is an optional poster, so while it is recommended that you post this if it is relevant to your employees, you are not required to by the Workforce Commission. This optional poster describes the occupations that minors are prohibited from working as well as restrictions on the hours that minors can work and if a certificate of age is required for child actors or not. It appears you don't have a PDF plugin for this browser. 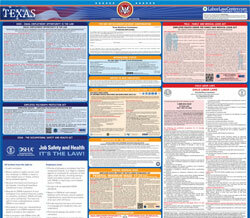 Please see the link below to download texas-child-labor-law-poster-twc.pdf. nearest office of the United States Department of Labor. (11)   in operating or assisting to operate power -driven bakery machines. (17)  *in connection with excavation operations. age. Consult 51.0145 Texas Labor Code for exceptions and requirements. (5)    between 9 p.m. and 7 a.m. from June 1 and Labor Day. authorization on a form provided by the Texas Workforce Commission. Commission’s requirements. Contact 1 -800-832-9243 for instruction. injunctive relief in district court against an employer who repeatedly violates the requirements established by this Act rela ting to the employment of children. Federal  — The FLSA prescribes a maximum administrative penalty of $11,000 per violation and/or  criminal prosecution and fines.